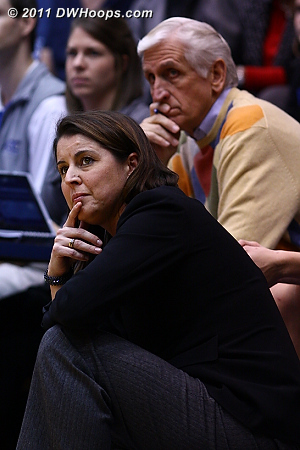 If you enjoy our photos please consider supporting DWHoops with a 2011 membership. 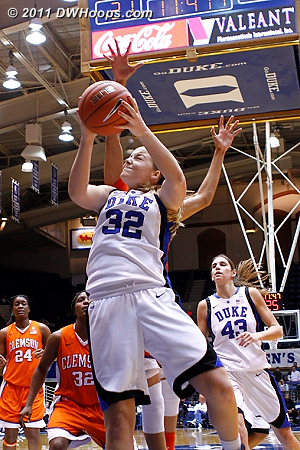 Clemson's Kirstyn Wright scored the first basket of the game, but Duke would score the next 18 points. 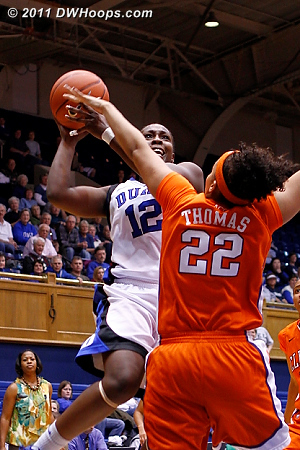 Jasmine Thomas drives by Sthefany Thomas on her way to scoring Duke's first hoop of the night. 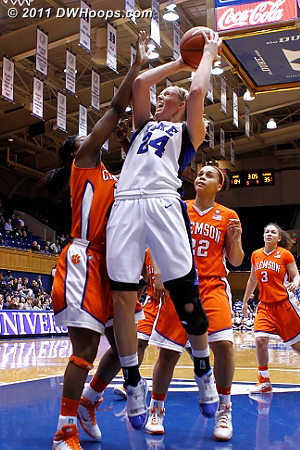 Karima Christmas fouls Clemson's Kirstyn Wright. 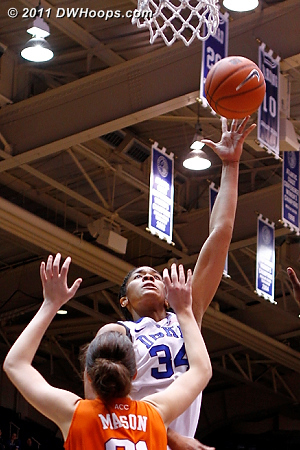 Yes, this is a foul. 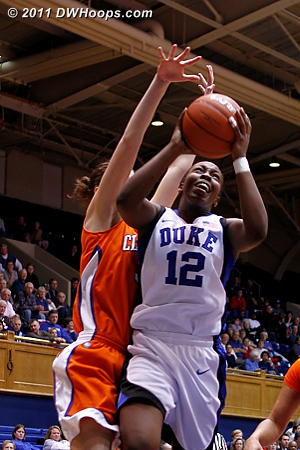 Chelsea Gray's first hoop made it a 9-2 Duke lead. 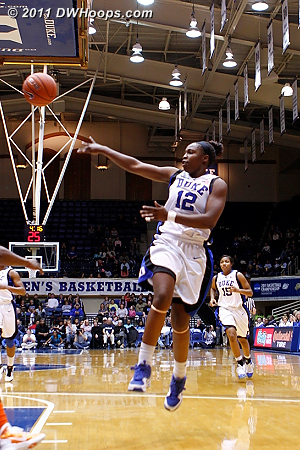 Shay Selby goes behind the back to a surprised Krystal Thomas, one of many deft passes she made tonight. 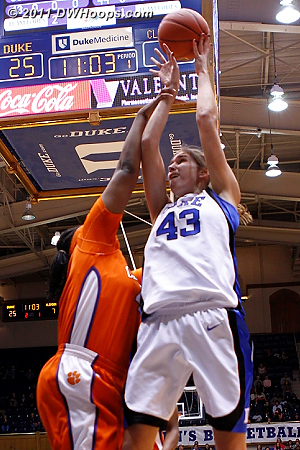 Tricia Liston goes strong to the hoop, a score plus the foul from Chancie Dunn. 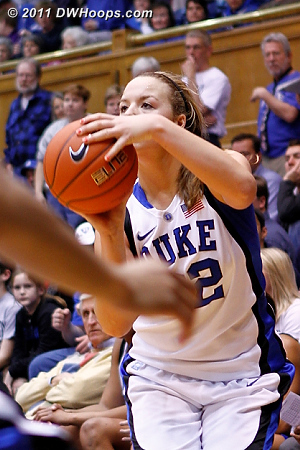 Haley Peters gets into the scoring act with a baseline jumper, Duke leads 25-7. Allison Vernerey is hacked by Shaniqua Pauldo. 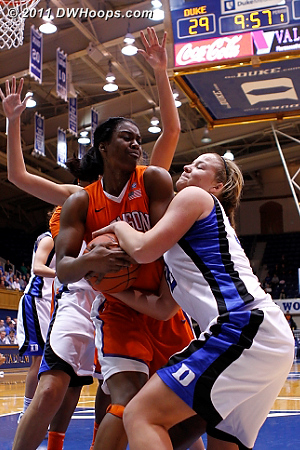 Tricia Liston tries to wrest possession from Jasmine Tate, Duke has the arrow and gets the ball. 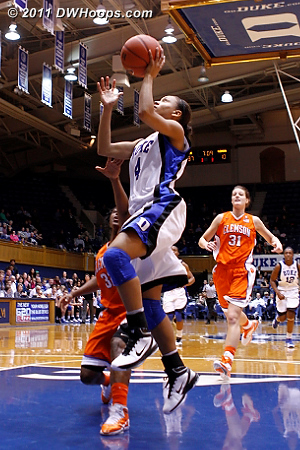 Off one of Duke's 12 first half steals Chloe Wells starts the Blue Devil fast break. 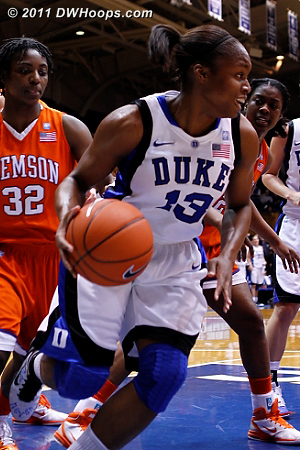 Clemson Head Coach Itoro Coleman encourages her team during Duke's gargantuan 24-0 run. 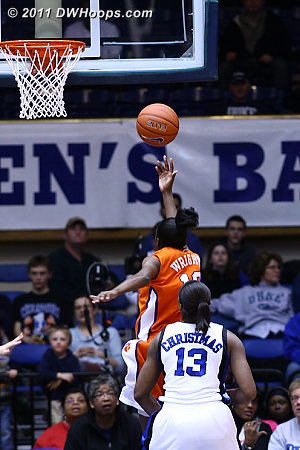 Chelsea Gray goes back to the goal again for two of her ten first half points. 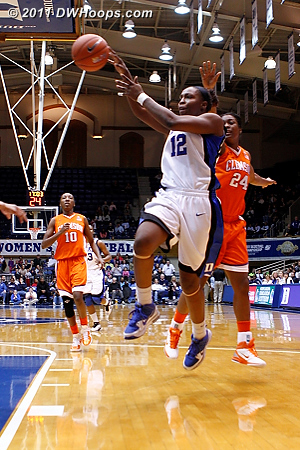 Jasmine Thomas hits from the corner - Duke had eight first half threes, shattering their season high. 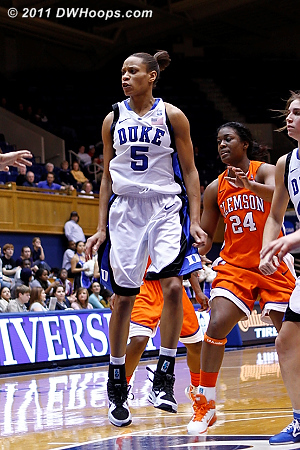 Shay Selby answered Clemson's 5th basket with Duke's 22nd, a corner trey. 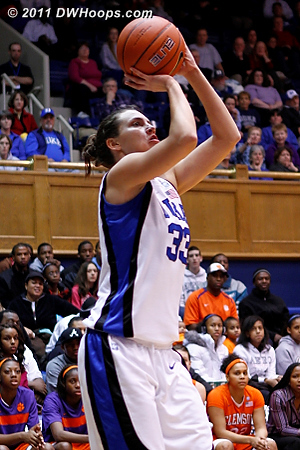 Kathleen Scheer was the last of the eleven Blue Devils to score in the first half, nailing a trey over Sthefany Thomas from the opposite corner with two seconds left. Coach P and Al Brown on the sideline as Duke is back on the line already. 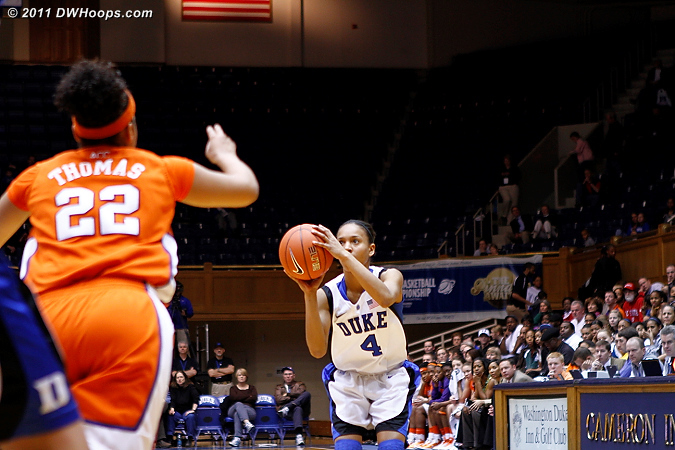 After only Wright and Mason scored for Clemson in the first half Kelia Shelton was able to get into the points column early in the second. 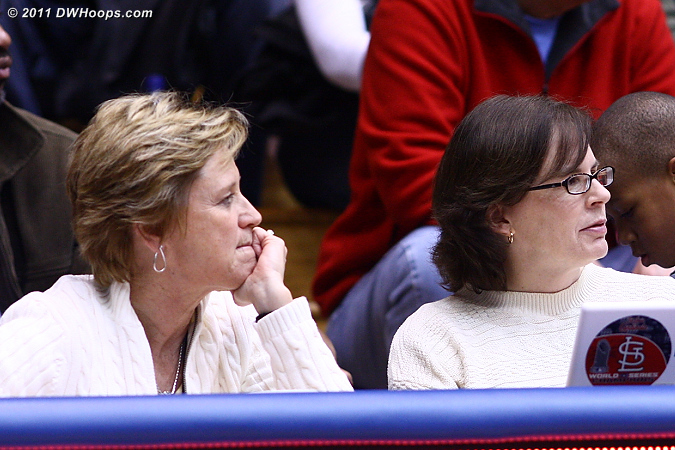 ACC Associate Commissioner Nora Lynn Finch (left) and ESPN's Mechelle Voepel on press row. 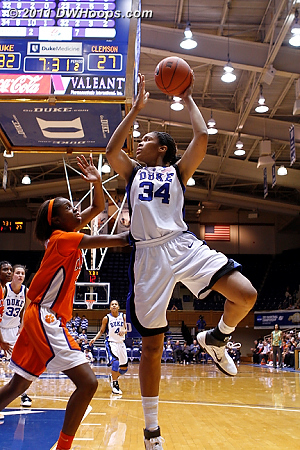 Chelsea Gray flies past Kelia Shelton on the way to the goal. 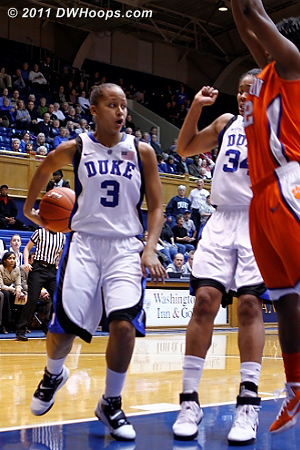 Shay Selby and Kelia Shelton tie it up. 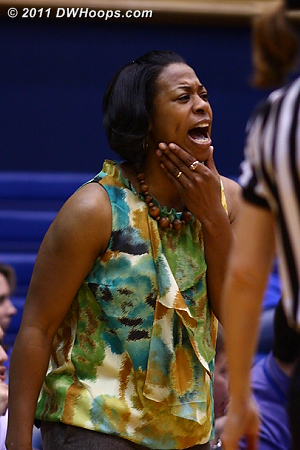 Tricia Liston sandwiched between Bryelle Smith (left) and Kelia Shelton. Thomas has no chance to stop Chloe Wells from draining this trey. 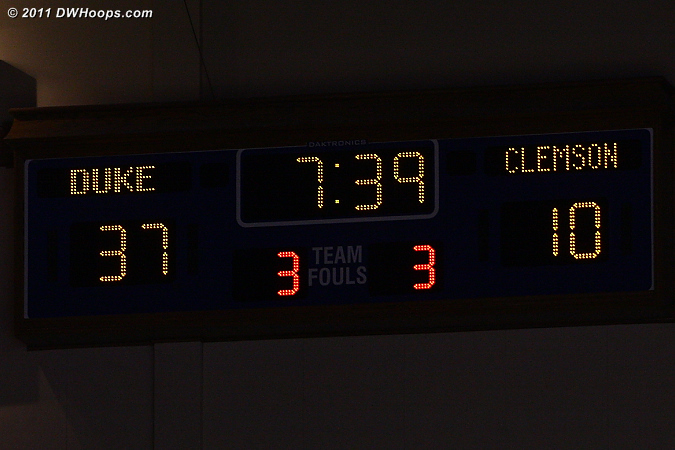 Shelton gets another good look again as Clemson managed 25 second half points. 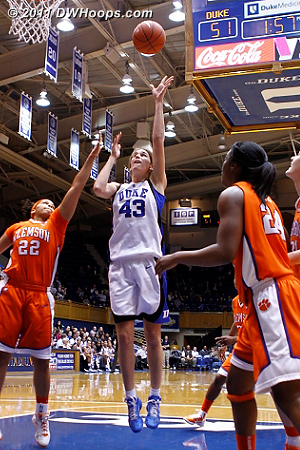 Tricia Liston zeros in on her second three point basket of the night. 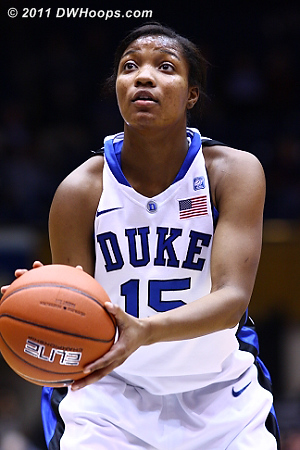 Chloe smartly pulls up in transition and drains it, Duke leads by 54. 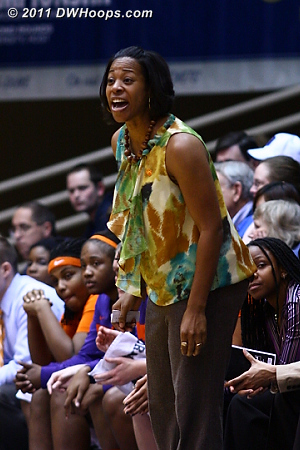 Clemson Coach Coleman still up and active despite the score. Chloe open again = basketball goes in again. 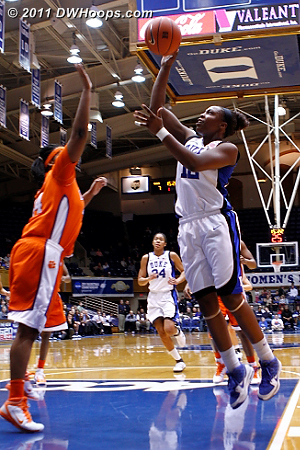 Krystal Thomas tries a tough baseline jumper. 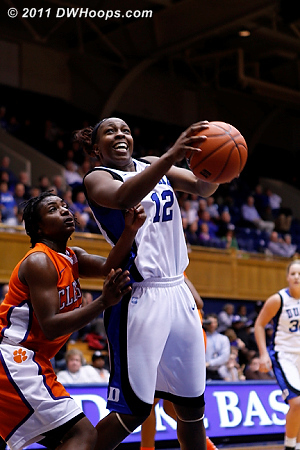 Jasmine Thomas after whipping a pass to Richa Jackson. 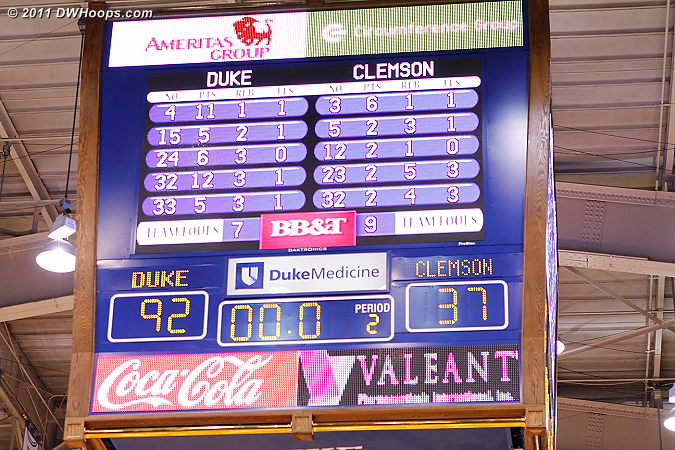 Ballgame! 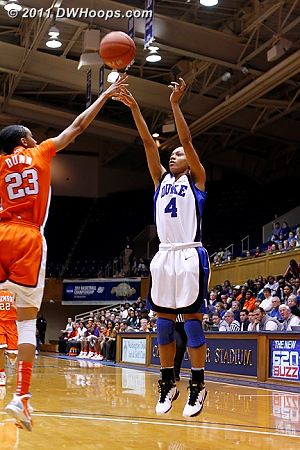 Duke finishes with five players in double figures and an even 50% shooting percentage. 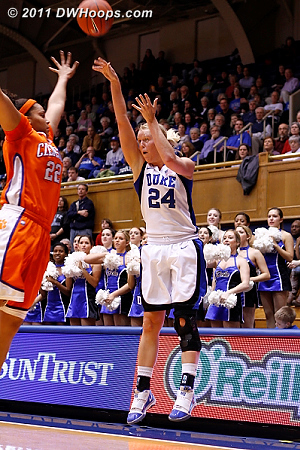 22 of Duke's 33 baskets were assisted and their 12 three pointers shattered their previous season high.